As the world’s no. 1 everyday footwear brand, Clarks sell over 50 million pairs of shoes every year across more than 35 countries. Clarks have been measuring children’s feet for over 90 years, and the starting point for re-imagining this process was a simple question; “how can we use digital technology to measure feet?”. From this emerged a brief to revitalise their in-store foot measuring consumer journey offering an immersive experience whilst providing accuracy and un-rivalled ease of use and ensuring that brand loyalty and the Clarks' USP was secured for the next generation. Working collaboratively with Clarks' internal Innovations team, Designworks quickly identified the opportunity to create a compelling solution using proprietary measuring technology developed by Designworks; the 'Digi-Tape' device used in conjunction with a custom designed iPad application thus delivering the most accurate of results ever achieved by a Clarks foot measuring system. The complete system is manufactured by Designworks, with a UK-wide and global fitout program managed by Designworks. Clarks can now proudly proclaim to provide a unique, digital-physical in-store and mobile customer experience that is simultaneously fun for boys and girls while remaining re-assuring for parents, all achieved whilst retaining that all important hands-on interaction with trained store staff. 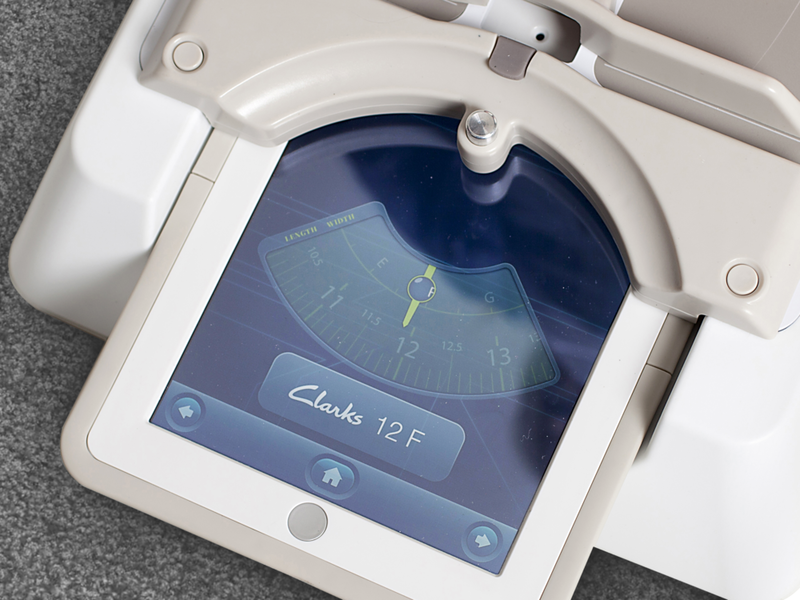 As well as extensive press coverage around the UK launch by publications including Retail Week, Retail Innovation, Essential Retail, Retail Focus, Shine and The Telegraph, the Clarks iPad Foot Gauge has been awarded the prestigious iF Design Award.